When it comes to football history, Belgium were the first mainland European country to play association football, which happened as early as 1863. In the many decades that followed, Belgium would experience numerous highs and lows. All told, they’ve made the end stages of 13 World Cups and 5 European Championships, finishing third at the 2018 World Cup and second at the Euro 1980. 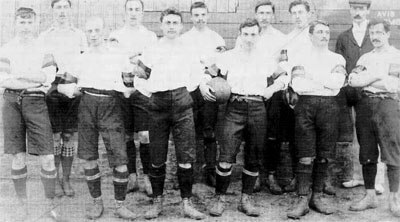 The team that played the first game for Belgium in 1901. The official date of football arriving in Belgium is 26 October 1863, which is when an Irish student named Cyril B. Morrogh brought a leather ball into the Josephites College of Melle. Soon enough, football replaced rugby as the nation’s most popular football sport. In 1895, ten clubs specializing in football, cricket, cycling, and athletics founded the UBSSA, a national athletics sports union. Next year, the UBSSA organized the first Belgian football league. All these new developments led to a rise of interest in national football. In 1900, Beerschot AC president Jorge Diaz organized a series of matches that saw Belgium face off against various opponents. Their first challenger was the Netherlands B-team, with Belgium winning each of the four matches with them. However, FIFA doesn’t recognize these bouts as Belgium fielded some English players. In their first official match, Belgium drew with France 3-3. From 1905 onwards, Belgium and the Netherlands would meet up and play on a biannual basis. This bout became known as the Low Countries derby, and it played a big part in developing a traditional rivalry. After one of these matches, a Dutch reporter noted that the Belgian players “worked as devils,” which led to the team becoming known as the Red Devils. Belgium made its first official appearance at the 1920 Olympics, claiming the gold medal on their home soil. However, this triumph was spoiled by a controversy in the final match, as their opponents Czechoslovakia abandoned the field. The visitors were unhappy with the performance of English referee John Lewis, who had allowed a contentious goal and sent off their left back, Karel Steiner. As a result, Belgium was awarded the gold medal by default. The team also took part in the first three World Cups ever organized (1930, 1934, 1938), losing each of the four matches they played. According to historians, Belgium couldn’t compete with the teams from Central Europe, South America, and Scandinavia, where football was enjoying a popularity boom. After the outbreak of World War II, the team ceased all official activities. The post-war period brought additional difficulties for Belgium. Out of eight major tournaments from 1950 to 1968, the team qualified for just a single one: the 1954 World Cup. After a 4-4 opener against England, Belgium lost 1-4 to Italy and failed to qualify for the knockout rounds. In the 1958 World Cup qualifiers, they were drawn as a “lucky loser” and given the chance to play against Israel, but they refused as they felt that the second chance was beneath them. The early ‘70s saw the team take a few strides forward. After managing to qualify for the 1970 World Cup, they won their first match in the competition by defeating El Salvador 3-0. However, they lost the following two games, failing to qualify for the knockout stages. Two years later, they went a step further by making it to the final stage of the Euro 1972. Following a close loss to West Germany in the semi-final, Belgium defeated Hungary 2-1 in the third-place playoff. During this period, Belgium was coached by the legendary Raymond Goethals. Among his many contributions to the national team, Goethals popularized the use of the offside trap, which later became one of the team’s key strengths. An even bigger piece of the puzzle proved to be the emergence of Paul Van Himst. During his rich career in the national team, Van Himst became Belgium’s joint-top goalscorer with 30 goals in 81 appearances. Their first taste of World Cup success arrived in 1982, when they defeated defending champions Argentina 1-0, topping their group in the process. The second stage was too big of a hurdle to overcome, though, and they lost both to Poland and the Soviet Union. Still, it was clear that the main thing that was holding the team back was a simple lack of experience. Most pundits agreed that this generation was too talented not to compete for major trophies. The 1986 World Cup didn’t start particularly well for Belgium, as they barely escaped their group as the third best-placed team behind Mexico and Paraguay. They made up for it in the knockout stages by outlasting the Soviet Union in extra time and defeating Spain on penalties. The Maradona-led Argentina in the semi-final was a step too far, though. Despite putting up decent resistance, they were unable to stop Maradona from eliminating them with a brace. By then, the team could count on other world-class players such as Michel Preud’homme, Franky Van der Elst, and Enzo Scifo. As such, their streak of good results showed no sign of stopping. At the 1990 World Cup, they again made it past their group, facing England in the second round. This turned into another heartbreaking loss, as Belgium dominated most of the match only to be eliminated by a goal from David Platt in the final minute of extra time. Though the team qualified for the following three World Cups as well, they never managed to make it past the second round. They came closest in 2002, where they proved to be a tough opponent to eventual champions Brazil. By that point, the vast majority of the golden generation -- including later additions such as Marc Wilmots -- had retired, signaling the beginning of a more depressing era for Belgium. With the old guard gone, the team missed out on the Euro 2004. As it turned out, this was just the first of five consecutive failings to reach a major tournament, a streak that lasted until the 2014 World Cup. In 2007, the team’s FIFA ranking slipped to the 71st position, the lowest it had ever been. Despite numerous coaching changes during this period, the team’s fortunes weren’t improving. The only bright spot for Belgian fans during this era were the results of their U-21 selection. After placing 4th at the 2008 Olympics, many young players from this squad started making their debuts in the senior team. However, these changes didn’t lead to immediate success. The young guard only became a lynchpin of the team in 2012, which was partly a byproduct of Marc Wilmots becoming the team’s manager. Following Wilmots’ appointment, Belgium started using a disciplined style of play that focused on retaining possession and relying on the team’s talented strike force on the offensive end. This was seen as a shrewd move, as Eden Hazard, Kevin De Bruyne, and Romelu Lukaku were capable of scoring against any team they faced. With Vincent Kompany commanding the defense, this Belgium squad was just as well-rounded as the original golden generation. After dominating their 2014 World Cup qualifying group with 8 wins and 2 draws, Belgium managed to make it to a major tournament for the first time in 12 years. They also won all three games in the group stage and defeated the United States in a 2-1 overtime thriller, but eventually lost to Argentina in the quarter-final match. They followed this up with a solid showing at the Euro 2016, where they were eliminated in the quarter-finals by Wales. Before the 2018 World Cup, many pundits considered Belgium as a dark horse for winning the entire tournament. The team lived up to the lofty expectations by going unbeaten in their group and defeating Japan and Brazil on their way to the semi-finals. This time around, old rivals France were the better team, winning the match on a header from Umtiti. In the third-place playoff, Belgium outlasted England 2-0, recording their best finish in the competition. 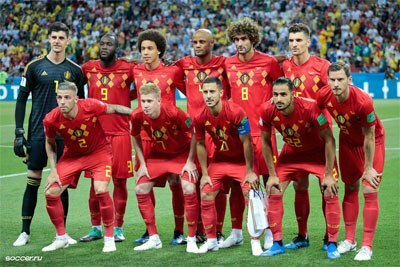 Belgium starting XI in World Cup 2018. Belgium has participated 13 times in the World Cup. * The reason given was unpreparedness. Belgium have participated 5 times in the European Championship (Euro). The logo features a crest flanked by a weath wreath and a crown on top. The crest has the Belgian flag as a background behind the letters URBSFA (Union royale belge des sociétés de football-association) and KBVB (Koninklijke Belgische Voetbalbond).